Eucalyptus boliviana is known as the Bolivia Hill Stringybark and develops into either a single-trunked tree reaching a height of about 12 metres or a five metre, multi-stemmed mallee. This mallee growth habit is probably triggered by bushfires and occurs in the wild. Cultivated plants will usually have a single trunk as does the specimen in our cold climate garden. Branchlets are square and dull green with a whitish bloom. This is an unusual feature in mature eucalypts. Juvenile leaves are dull green. Initially adult leaves are leathery, dull green then age to glossy green. Mature leaves range in size from 8 to 16 centimetres in length. The flowers, on our specimen, are cream although the botanical description gives their colour as yellow. They are said to be held in clusters of seven. Our buds and blooms are only in twos and threes. The first flowering occurred four years after planting. The flowering period is another difference between official descriptions and our specimen. September is the official flowering period whereas our plant blooms in July. Gum nuts are hemispherical and broadly funnel-shaped. 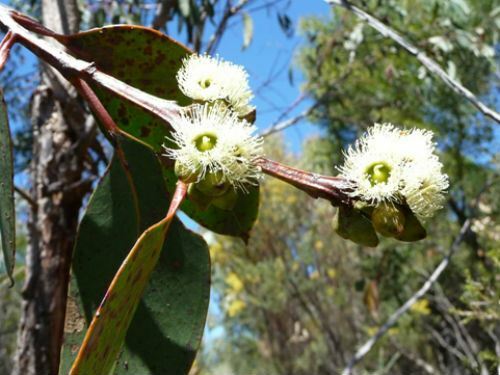 Eucalyptus boliviana is one of Australia’s rarest Eucalypts.The only occurrence is in the Bolivia Hill Nature Reserve (hence the species and common names), north of Glen Innes on the Northern Tablelands of New South Wales. The total population is calculated at less than 1500 individuals. Fortunately the species is coming into cultivation, thanks mainly to the Armidale Tree Group, the local community nursery, so the future of this rare and unusual Eucalypt is assured. The species was named in 2001. We have found Eucalyptus boliviana to be hardy and resistant to both drought and frost. The thumbnail shows the buds.